All of the Panda Express locations in the Las Vegas Valley have partnered with Community Lutheran Church to benefit the church’s annual medical mission trip to El Salvador. 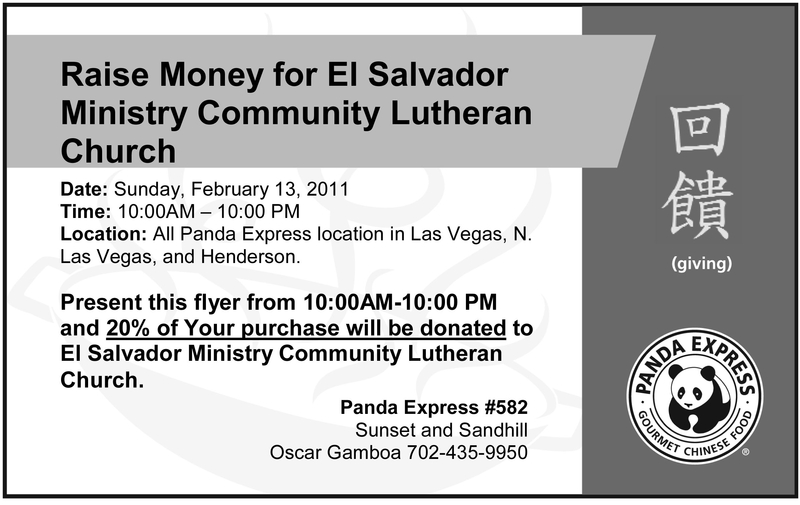 Twenty percent of all purchases made at any Panda Express in the Las Vegas Valley from 10 a.m. to 10 p.m. Sunday, Feb. 13, will be donated the medical mission, which, each year, provides medical care, medications and ministry to more than 1,000 people from several indigent villages throughout El Salvador. Fundraising fliers must be presented at time of purchase to ensure 20 percent of the proceeds from all dine-in purchases benefit the mission trip. To download a flier, visit the mission’s Facebook page. Community Lutheran Church, which has more than 3,500 members, has been traveling to El Salvador to serve its people in various capacities for nearly 10 years.